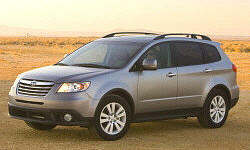 Would it be worth it to buy a used 2008 Tribeca? See a problem? Edit this question. Sorry about the lack of a response. We don't have many members with these, probably because Subaru didn't sell many. You might have a little more luck at the Subaru Tribeca forum, though it's much less active than it used to be. Mr Karesh is right - there are not many Tribeca's floating around out here. It was an oddly designed beast (for the first few years) and was kind of thirsty (gas mileage). They have the large V6 motor 3.6 liters?) and standard AWD. They're pretty comfortable and stable. A friend of ours has one (not sure of the year) but it has been around a while and she's still motoring along with it and the vehicle is keeping up. Like most Subaru vehicles, you have a very good chance on getting a long life out of the Tribeca. I had a 1987 Subaru "DL" 4WD wagon and it went out of my life when a head gasket popped... at 350,000 miles. The repair would have been 1200 bucks - on a car I paid 900 for at an auction. As I said, the Tribeca is a bit thristy, but should be a reliable vehicle for many years to come. I have owned a 2006 for 7 years. These are wonderful cars to ride in and extremely stable in snow and ice. Mine was fomerly a rental and, I found out later, was wrecked and not properly repaired. Had those things done and don't regret it. Pall repairs on these are costly as the cars require mostly factory parts and are hard to work on. Spark plug changes require the engine to be raised up but not removed from the car. the transmission filter is inside a wheel-well. Despite that, I love these cars and would buy another without hesitation. Get an accurate history before you buy and have it inspected by a mechanic who knows Subaru. By the way, I'm not a Subaru fan; hate the philosophy and their ads. They cost too much to maintain and their reliability and gas mileage are only average...but this car is the best road runner I have ever owned.